A total of 108 players are through to Day 2 of the WSOP-C UK Main Event and Malcolm McKinlay holds the chip lead. The £1,100 buy-in £1 million guaranteed World Series of Poker Circuit (WSOP-C) UK Main Event has seen two of its four starting flights completed and 108 players have safely navigated their way through the shark infested waters at Dusk Till Dawn to progress to Day 2. Day 1A saw 53 players remaining at the end of 10-levels with Malcolm McKinlay ending the day with 441,600 chips, the only player to bag up more than 400,000 chips. McKinlay is no stranger to the folks at Dusk Till Dawn as all 16 of his live poker tournament cashes since May 2014 have been in DTD events. Jean Lhuillier was another player giving themselves a chance of a massive payout by starting the tournament at a blistering pace. Lhuillier bagged and tagged an impressive stack of 360,900 chips and will be hoping for at least a repeat performance of his third-place finish in the £165 DTD Grand Prix in Jan. 2019 that netted him a career-best £21,100. Some of the other notable players punching their Day 2 ticket from the opening starting flight included, Thomas High (220,200), Usman Siddique (219,300), Dean Hutchison (150,500), former Premier League footballer Anthony Gardner (124,000), Will Davies (107,200), and Yiannis Liperis (82,900). Day 1B saw another 55-players safely make it through to Day 2 of the £1 million guaranteed Main Event led by Jonathan Stokell who finished the night armed with 394,000 chips. Stokkel’s only recorded live cash came in Mar. 2019 when he finished seventh in a £225 Grosvenor 25/25 Series event in Stockton for £900. A min cash here will more than double his total live winnings. Stokell was joined at the top of the chip counts by the reigning GUKPT Goliath champion Florian Duta. The UK-based Romanian bagged up 265,400 chips to put himself in a commanding position going into Friday’s Day 2. Again, several notable players will be seated on Day 2 after progressing from the second of four starting flights. These include WSOP-C UK Super High Roller champion Orpen Kisacikoglu 9172,600), Ali Zihni (153,700), Kuljinder Sidhu (144,800), WSOP bracelet winner Joey Weissman (133,300), Leon Campbell (99,000), Ben Winsor (79,800), and Michael Kane (75,000). Day 1C kicked off at 12:00 p.m. on Apr. 11 and is the penultimate starting flight. Players can get involved in a turbo-blind structured six-handed Day 1D on Apr. 12 if they can drag themselves to DTD for the 10:00 a.m start. Day 2 shuffles up and deals at 2:00 p.m. on Apr. 12, with Day 3 commencing at the slightly earlier time of 12:00 p.m. on Apr. 13. The final day’s play starts at 12:00 p.m. on Apr. 14. 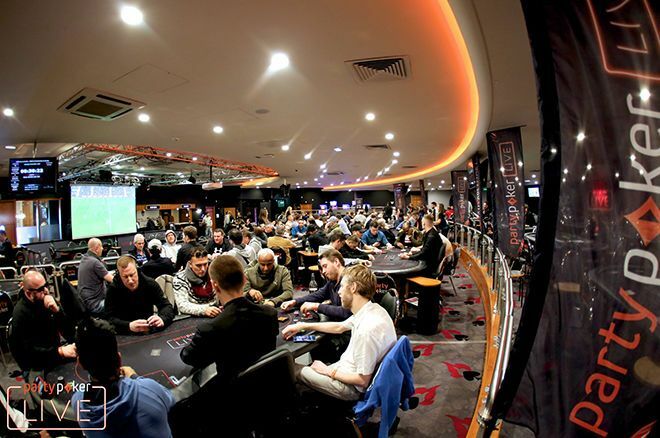 Players can also get involved in the £550 buy-in £200,000 guaranteed Monster Stack, the £330 buy-in £200,000 guaranteed Closer, £2,200 buy-in £200,000 guaranteed High Roller and a £550 buy-in £50,000 guaranteed Pot-Limit Omaha event before the curtain comes down on the festival on Apr. 14.